As you plan for a tiling job, you are often confronted with a bewildering array of adhesives. But choosing the right tile mortar can be a lot simpler than you might think. In most cases, the tile application—where the tile is installed—determines the best mortar option. And sometimes the type of tile itself is a determining factor. There are three basic types of tile mortar to choose from: thinset, tile mastic, and epoxy mortar. Thinset is your go-to tile mortar for most indoor and outdoor applications. Traditional versions are cement-based powders that are mixed with water prior to application. Thinset tile mortar provides a very strong bond and is resistant to moisture and mold growth. It is also heatproof, so it won't lose its grip in hot environments. Thinset tile mortar has a smooth, slippery consistency, similar to mud. Since thinset tile mortar has a tendency to crack, it might be recommended that you mix it with a special latex additive. Dry, powdered thinset: Standard thinset comes in bagged powder that you mix with water. The mortar begins setting once it's mixed, so you have to use up the entire batch or discard any excess; you can't save it for later. Premixed thinset: Premixed thinset comes in big tubs and is ready to apply right out of the package. Even though it is heavy to carry home and more expensive than dry mortar mix, it is usually best for DIYers to use premixed mortar for spaces such as small bathrooms, mudrooms, or utility rooms. If you are dealing with multiple spaces, then you may want to consider dry mix in order to save money. One of the best advantages of thinset is that it allows you to level uneven surfaces to some degree. You cannot level wildly out-of-level surfaces, but you can bridge gaps and compensate for slight level changes. 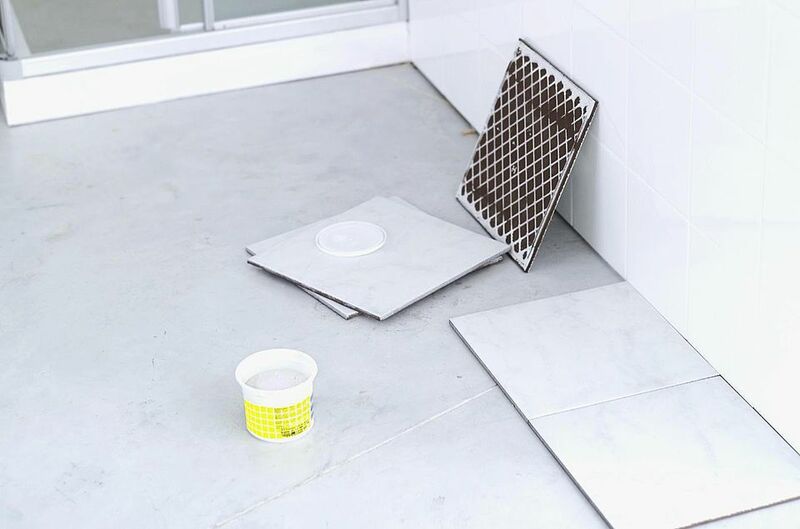 Because thinset is not affected by moisture, it is best for floor tile and all tile in wet areas, including shower floors, walls, and ceilings and tub surrounds. Sometimes called "organic" mastic or adhesive, tile mastic is a sticky tile adhesive that comes in premixed tubs. It is best for applications in dry areas, such as walls in kitchens and living areas. Mastic is a water-based acrylic glue that is not moisture-resistant or heat-resistant. Also, unlike thinset tile mortar, organic mastic does not let you level the substrate or the underlying surface. The best things about mastic are that it's easy to use and it cleans up quickly with water. It also keeps for a long time in its bucket. Tile mastic cannot be used with glass tile. Epoxy is a resin-based compound that comes in three separate components: resin, hardener, and powder. Epoxy sets quickly and is extremely strong, allowing you to get to the grouting of the tile within just a couple of hours. It is impervious to water, so it does not need any special latex additives, as does some thinset. Epoxy-based mortars have high compressive strength and stick well to resin-backed stones. They are also chemically resistant. On the downside, epoxy mortar is expensive and has a powerful smell before it cures. Additionally, it sets quickly; this can be a deficit because it does not allow for you to make changes. Due to the difficulty in mixing and working with epoxy mortars, they tend to be used only by professional tile installers.